"Though only eleven, little Ana showed promise of greater beauty than either of her two sisters, or so Nicolas thought. She had dark, curly hair and a small porcelain-like face with greenish, expressive eyes as mysterious as those of a cat." 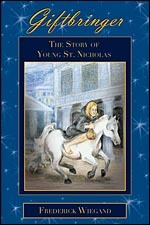 Giftbringer is a special book that tells the story of young St. Nicholas from a historical standpoint, yet presents it in novel format, all the while injecting the reader with a subtle underpinning of Christian values. "... the stockings were hung by the chimney with care, in the hope that St. Nicholas soon would be there." "... therefore, Christian men, be sure, wealth and rank prossessing, ye who now will bless the poor shall yourselves find blessing." GIFTBRINGER Now Available through Bookstores Nation-wide! It is now possible to order Giftbringer from any of the major retail chain bookstores such as Barnes & Noble, Borders, Waldenbooks, B. Dalton, or Amazon.com! This is a great opportunity to get copies for your friends and neighbors...or better yet, persuade them to purchase their own copies. 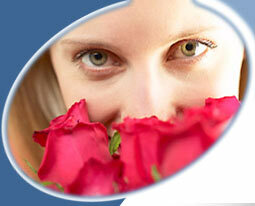 Click the Purchase button on the left to go directly to the publisher web site.